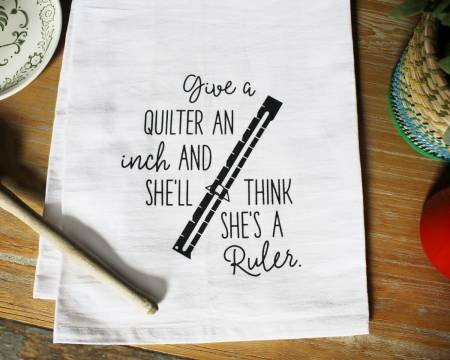 Aunt Martha's Dirty Laundry - GIVE A QUILTER AN INCH, AND SHE'LL THINK SHE'S A RULER. These gag towels are a real gas! Life is short... give someone the gift of laughter. One (1) 28 x 28 inch old-fashioned flour sack towel. Black silkscreen design measures approximately 7 inches printed on bottom-center of towel. 100% cotton. Wash in warm water with like colors.